This month marks one year since we sent out our first Boston DGT family friendly volunteer opportunities listing and we'd like to hear from you, our subscribers. How have you and your family used this information? Please send us your photos, stories, and feedback. We'd love to hear from you! goCreate is an initiative to engage youth and families in service. Boston Cares offers a hands-on portable project on one Sunday each month for kids to get crafty while making an impact. Each month's project will meet a community need and the completed goods will be donated to local agencies to fulfill that need. Make Lunch Bags of Love: insulated lunch bags filled with homemade placemats, icepacks, conversation cards, and simple food recipes that aim to create a lively dinner table and make cooking nutritious food for deserving Bostonians easier. Put together and decorated by generous local volunteers, Lunch Bags of Love are being donated to Boston food banks and services like Lovin' Spoonfuls and Rosie's Place. These agencies will distribute them to lower income families throughout the city. This event raises funds for research, celebrates ovarian cancer survivors, remembers those lost to the disease, and promotes ovarian cancer education and awareness. Volunteer activities include: Day-Of Registration Envelopes, Parking Attendants (waive cars into parking lots), Course Patrol, Refreshment Tent, Volunteer Check-in, Set-up/ Tear-down, Face Painting, Balloon Animals and more. Volunteer registration is available online. Ages: Families with children can participate in the walk/run. Click here to register. If you are attending the run/walk with children under the age of 6, you need to fill out the waiver form and bring it with you the day of the run/walk. Volunteers need to be 13 or older. The Boston Heart Walk, a non-competitive walk, will bring together over 100 of the top companies and hospitals in the Boston Metro area. On average, more than 10,000 people from throughout Greater Boston participate each year. The Boston Heart Walk raises money to fund research and education, advocate for health, and save lives. Help make an impact and join us! Volunteer positions include helping out in the activity tents, passing out waters to walkers, cheering walkers along the routes, and more. Ages: Families with children can participate in the walk; teens and adults are welcome to volunteer at the event. The Alzheimer's Association Walk to End Alzheimer's® is the world's largest event to raise awareness and funds for Alzheimer's care, support and research. Held annually in more than 600 communities nationwide and 11 locations in our region, this inspiring event calls on participants of all ages and abilities to reclaim the future for millions. Families with children can volunteer at water stops, cheer along the route or at the start/finish line and even distribute promise garden flowers. Contact: 617.868.6718, alzwalkMANH@alz.org. Volunteer registration is available online. Pitch in with other volunteers for the annual beach clean-up on Plum Island. COASTSWEEP is the annual statewide cleanup of Massachusetts's coastal and riverine environments. For more than 20 years, COASTSWEEP has engaged thousands of volunteers in cleaning hundreds of miles of shoreline and riverbanks. This COASTSWEEP project will involve removing trash and debris from the beaches on Plum Island, including the Parker River National Wildlife Refuge, Sandy Point State Reservation, and the north end of the island. In the past eight years, they have collected over 15 tons of debris! Activities for children are offered via our COASTSWEEP Free-for-All. Give them a hand and help protect the nature of Massachusetts. Participation in COASTSWEEP is free, and people of all ages are welcome. Mass Audubon staff will provide supplies, but volunteers are advised to bring their own work gloves. The event will be held rain or shine, so be sure to dress for the weather. Time Commitment: Participants do not need to preregister and may show up at any time between 9am and 5pm. Each year, JDRF One Walk (formerly JDRF Walk to Cure Diabetes) brings together more than 900,000 people to change the future of type 1 diabetes (T1D) and they need your help! Volunteers sustain JDRF's leadership in T1D research funding. Share your talent and time and make a meaningful difference to people living with T1D. This is a family-friendly 5K walk. Ages: Open to all ages for fundraising and the walk. Click here to register for the walk. Volunteers must be a minimum of 15 years old and accompanied by an adult. To sign up to volunteer please complete the online form. Date/Time: Throughout September. Hunger Action Day is Thursday, September 3. During Hunger Action Month, the national network of Feeding America food banks unites to generate awareness about hunger in America and to mobilize the public to take action. One in nine residents of eastern Massachusetts doesn't know where their next meal will come from. And, of that number, as many as one in four are children. This September, Feeding America has made the spoon the icon for Hunger Action Month. Follow the Greater Boston Food Bank (GBFB) on Facebook, Twitter and Instagram. You can post a spoon selfie on social media with a fact about hunger and challenge others to do the same! Your efforts can make a difference in someone's life, whether it's one meal, one hour volunteering, or even one selfie! Visit GBFB's website for more information about how you can make a difference during Hunger Action Month. Start a new school year with a new kindness commitment that will keep giving on your calendar month after month. Family-to-Family is a nonprofit national hunger and poverty relief organization dedicated to connecting, one-to-one, families with enough to share to impoverished American families with profoundly less. Family-to-Family programs create a bridge between communities with "more" and some of our country's poorest areas. Start the new school year with a new kindness commitment that will keep giving on your calendar month after month. You and your family can help an American family living in poverty with a monthly box of groceries. Your monthly donation or the box of food you ship will ensure that "your" family gets the food they need the last week of every month, when food stamps often run out. After you sign up we'll send you details about the family you're helping. 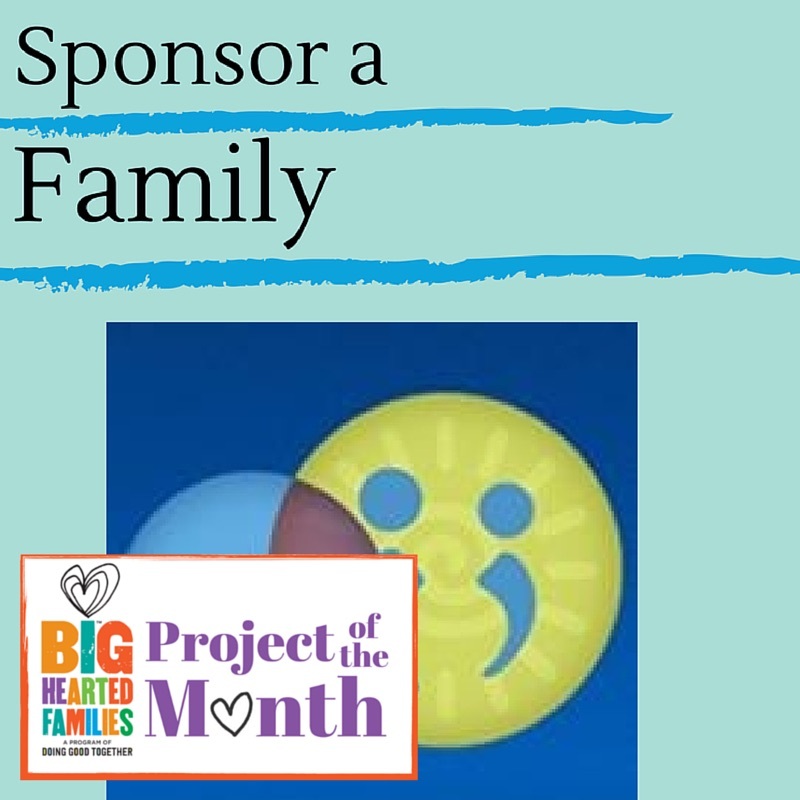 Visit the DGT™ Sponsor a Family project page for reflection ideas, book suggestions, and ways to take this project further.